Window box gardening is a form of small-space landscaping. The best plants to use are compact enough to fit within the boxes' confines and provide lasting interest in the form of flowers, foliage and even fruits. The plants should be selected for their suitability to the site's direct sunlight or shade level and its U.S. Department of Agriculture plant hardiness zone. Some of the best window box plants work equally well as single plantings as they do in combinations of several species. Drought tolerance is often an asset for window box plants because their containers can be difficult to access for watering and because some gardeners neglect those planted areas. A variety of flowers and plants growing in a window box. Red geraniums grow in a sunny window box. 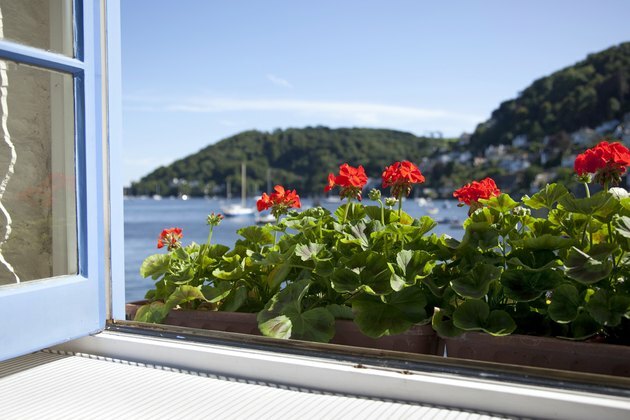 Window boxes in sunny locations are best for plants that can stand some dryness. They include the annual nasturtium (Tropaeolum spp.) and the perennial zonal geranium (Pelargonium x hortorum). Nasturtium thrives in even the poorest soil and features rounded foliage and colorful, trumpet-shaped flowers as it blooms often throughout the growing season. Depending on the variety, nasturtium has a mounding, trailing or climbing habit. Zonal geranium, hardy in USDA zones 10 through 11 and grown as an annual elsewhere, is an upright plant with large, colorful flower heads, and it blooms repeatedly. Some kinds have variegated or marked foliage. A close-up of red and yellow coleus plants. Shade-loving plants such as coleus (Solenostemon scutellarioides) and wishbone flower (Torenia fournieri) thrive in shaded window boxes with consistently moist soil. Coleus is hardy in USDA zones 10 through 11 and grows as an annual elsewhere. Reaching 3 feet tall and wide but easily pruned, it provides showy foliage throughout the growing season. 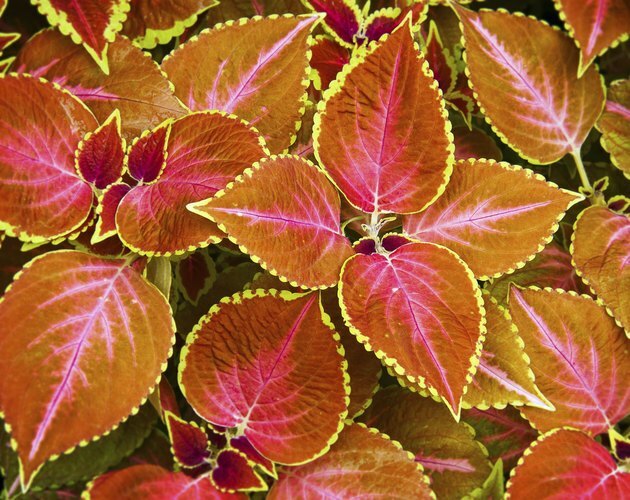 Window box culture is ideal for preventing the spread of the sometimes-invasive coleus. Wishbone flower, an annual plant, features small, trumpet-shaped flowers in shades of purple, white, yellow and pink; it blooms from late spring through frost. The plant bears an abundance of serrate, light-green leaves. Vines and roses growing from a window box. 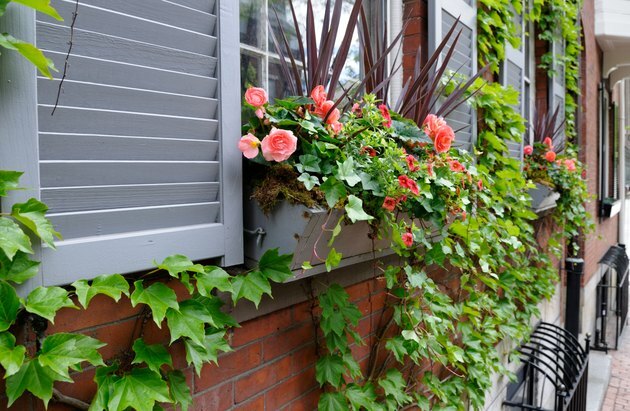 Plants with trailing stems spill gracefully over window boxes' sides. Among the trailers is sweet potato vine (Ipomoea batatas); hardy in USDA zones 9 through 11, it often is grown as an annual. Its lobed leaves are chartreuse, purple, dark green or bicolored, depending on the variety, and trail 8 or more feet. Often grown in hanging baskets but suitable as window box trailers, fuchsia, or lady's eardrops (Fuchsia spp. ), is a shade-loving plant hardy in USDA zones 10 through 11. Its pendulous, tubular blooms in shades of pink, red, white and purple appear repeatedly during the growing season. A woman plants flowers in a window box container. Window box plants succeed best when housed in sturdy containers with sufficient drainage. Use a lightweight potting medium and boxes with drainage holes in their bottoms. 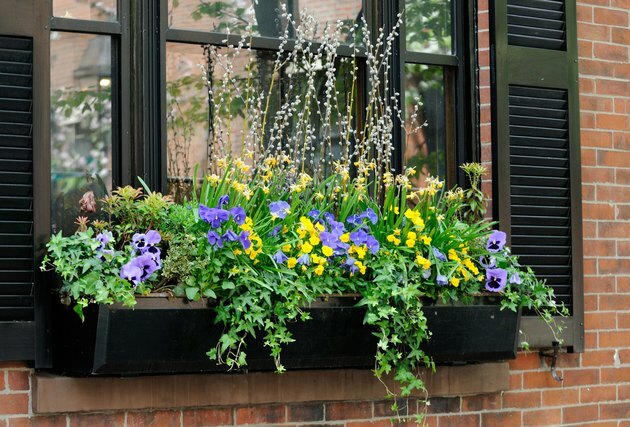 Window boxes likely to go long periods without watering should be filled with a moisture-retaining potting mix. Alternately, use self-watering window boxes, which feature built-in reservoirs that can be filled periodically. Annuals that often fill window boxes tend to be heavy feeders. 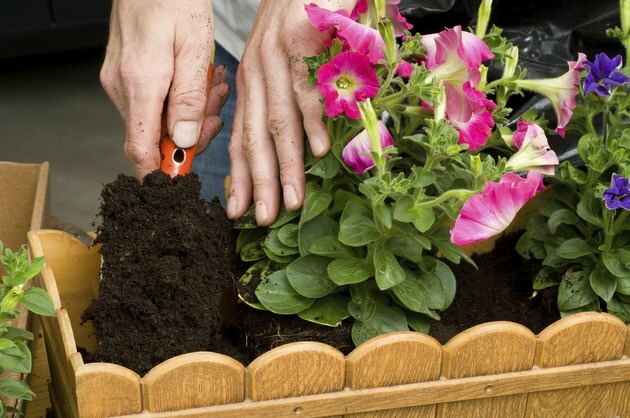 Apply a liquid, ready-to-use fertilizer, such as a 0.02-0.02-0.02 blend, directly to their soil every 10 to 14 days. The exact quantity of fertilizer to use depends on a window box's size.